Do you know what an Automated External Defibrillator (AED) is? Operation Hammond believes it’s vital that everyone knows what an AED is and how simple they are to use. 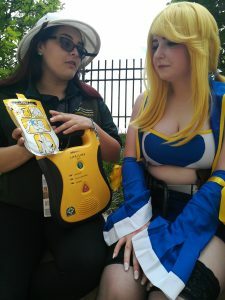 An AED is a device that has the ability to deliver an electrical charge to a heart that is not beating or is not beating effectively enough, such as in the case of cardiac arrest. This shock has the ability to correct the abnormal rhythm and allow for the heart to beat properly. These devices are carried by many emergency service personnel and can also be found in many public places for anyone to use in the event of a cardiac arrest. Operation Hammond believes it’s vital that everyone knows what an AED is and how to use one. When seconds count, these life-saving machines are one of the few tools that can help a person whose heart has stopped beating. As the country’s leading social medical charity for nerds, we feel that knowing how to identify and use these potentially life-saving machines is vital. We at Operation Hammond carry the Defibtech LifeLine AED to every show and event we attend. It supports the current American Heart Association and American Red Cross CPR protocols with simple, easy to hear instructions. American made and tested to military standards for vibration and shock, its award-winning design is compact, portable, and lightweight. More than 350,000 Americans die each year from Sudden Cardiac Arrest. Sudden Cardiac Arrest is a major public health problem and is a leading cause of death in the United States. For every minute that a person is in cardiac arrest and does not receive CPR or a shock from an AED, their chance of survival decreases 7-10%. Currently, a person who suffers Sudden Cardiac Arrest in the US, outside of a hospital, has just better than a 6% chance of survival. Once a victim has suffered a cardiac arrest, every minute that passes before returning the heart to a normal rhythm decreases the chance of survival by 10%. The average response time for first responders once 911 is called is 8-14 minutes. 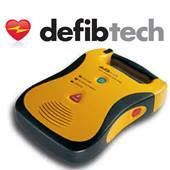 AEDs are one of the only devices that can correct a sudden cardiac arrest outside of a hospital. Check out our Services Page to find out about our CPR and AED training programs and classes we have available, or to have us at your show, convention or event. For more info about what an AED is and how anyone can use one, please check out and download our cool infographic. Feel free to post and share this info-graphic and page. 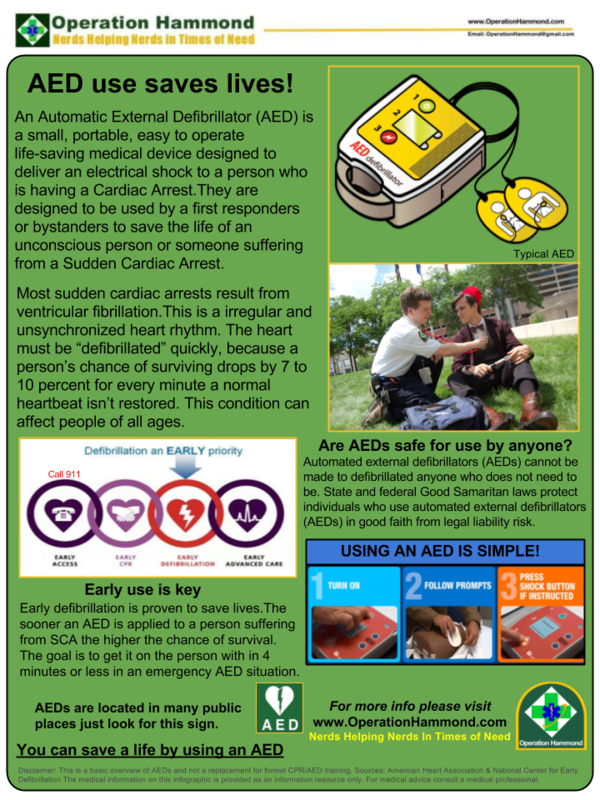 AED PSA Info-graphic Operation Hammond. This info is a basic overview of AEDs and not a replacement for formal CPR/AED training. The information contained in the infographic and PSA is provided as an information resource. For medical advice please consult a physician or in the event of an emergency call 911 or your local emergency services number.